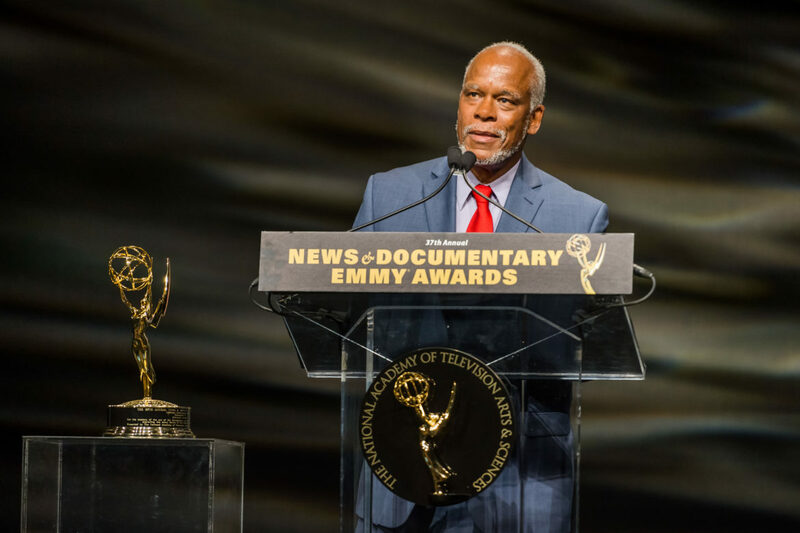 For the awards ceremony honoring this year’s News and Documentary Emmy winners, the National Television Academy tapped Bill Moyers to present a Lifetime Achievement Award to PBS filmmaker Stanley Nelson of Firelight Media. Moyers, a previous recipient of the Lifetime Achievement Award, recalled Nelson as a young producer working on Listening to America, Moyers’ weekly PBS series exploring issues that weren’t being covered in the 1992 election. “He struck me as always looking for what no one else had seen because he was hearing what no one else heard,” Moyers said. Nelson would go off on field assignments and come back with a story that no one else expected, “a better story, a different take,” Moyers said. Nelson went on to make his mark as an independent producer with The Black Press: Soldiers Without Swords (1999) and The Murder of Emmett Till (2003), produced for American Experience. The PBS history series, based at Boston’s WGBH, has presented many of Nelson’s documentaries over nearly three decades, including Jonestown: The Life and Death of People’s Temple (2007) and Freedom Riders (2011). His latest film to debut on PBS was The Black Panthers: Vanguard of a Revolution, aired in February on Independent Lens. In accepting the award, Nelson thanked his many funders and colleagues before describing the key people who helped him launch his career and how he, in turn, is working to open doors for emerging filmmakers. Bill Moyers, I have to say, changed my life. Bill did not know me from Adam. Somehow, he’d seen one of my first films, about Madame C.J. Walker, the first self-made American woman millionaire, and he sought me out and offered me a job. Bill looked away from his known circles, stepped out of his comfort zone and took a risk on a filmmaker whose work he thought had some promise. American Experience, PBS’s award-winning history series, did the same thing — they sought me out, and they took a chance. Taking a chance on me benefited not only me, but, I believe, Bill Moyers and American Experience as well. What they got was a point of view that may not have existed on their programs before: a look at history or contemporary society that many of their viewers had not seen on television before. Moyers and Nelson during the presentation of Nelson’s Lifetime Achievement Award. I’ve been thinking about the early years of my career — which were really not that long ago — because, until recently, I’d been watching a lot of television news. I’ve been horrified as the discourse has unfolded this election season — horrified at how much support has gone to a candidate who is openly racist and sexist, who is a habitual liar, and who is shockingly ignorant on real issues. I say “until recently” because I find myself unable to continue watching the news. It’s just too painful to realize that this is where our country is. I believe one of the biggest reasons we’ve gotten to this point is our failure to tell the full American story — to let through the voices of people and communities who are increasingly the numerical majority, but who live in the margins of our political process and our culture — including on television. Our failure to tell the full American story creates a fear and longing for a past that never existed. It leads to wanting to build walls instead of embracing the wonderful, unstoppable future that lays ahead. I feel privileged to have been able to contribute by telling a few — just a few — of the stories that have been left out of the American narrative. But it is up to me, and to all of us, to do more and better. One thing I’m doing is trying to expand my production company, so we can tell more stories and hire more people to help tell them. Six years ago, Firelight Media, an organization I co-founded with my wife and business partner Marcia Smith, started a Documentary Lab to help diverse emerging producers get their work done and out into the world. This is some of the most rewarding work I’ve done. The Lab has been tremendously successful, with 18 films completed, many of which have won awards at major festivals and even some Emmys. The Lab is now run by our wonderful colleague who is here tonight, Loira Limbal. We can all do better. At Firelight we’re going to try to do our part, and I challenge all of you to figure out what you can do. Step out of your comfort zone. Hire someone who doesn’t look like you. Take a chance on a producer, a writer or a camera person who otherwise would not be able to crack open the door of our very insular industry. Dr. Stanley Earl Nelson, Sr. — this is for you. And no, it does not come with any monetary remuneration.